With the horses all running well of late, we have been delighted to have a further three winners under both codes over the past couple of weeks. 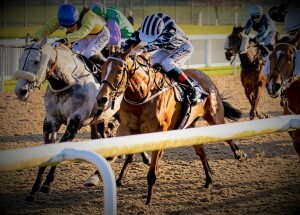 First up was Kingfast who on the 28th March was providing owners Mr G. Saville & Mr G. Brandrick with their first flat victory in the Play 4 To Score At Betway Handicap at Wolverhampton. This was Kingfast’s first run back of the year since enjoying a break through the winter months & was given the verdict in a 3-way photo finish, losing his maiden tag after performing consistently throughout last summer. A first victory for owners Clan McNeil came when Veiled Secret landed the Racing To School Handicap Hurdle at Hereford on the 4th April under Jockey David Bass. Clan McNeil have had various horses in training over the past few seasons but it was great to gain their first victory with Veiled Secret after the horse had shown promise on his early starts over hurdles last season & fingers crossed now that this is the first of many winners for them. Our latest victory came just yesterday (9th April) when providing our first winner for owner Mrs Joan Hitchings & husband Clive when Blackmill won the Join Racing TV Now Handicap Hurdle (Div1) at Exeter. Joan & Clive have been such great supporters of David Dennis Racing since the very early days & likewise of both NH racing & point to pointing for many years & it was very special to finally notch up a first victory for them both. Blackmill enjoyed a return to hurdles after previous chasing efforts & fingers crossed there are plenty of further winning opportunities to come for him in the future.